And unlike the embarrassing 3 or 4 shots he had blocked in Washington, I don’t think Yao was blocked once against the Knicks. He even took one of his most embarrassing moments Wednesday night — getting the “chair pulled out from under him” by Rose and falling on his backside — into a positive when he astutely called time-out before the ref even had a chance to call him for a traveling call (even though I don’t think he traveled, but that’s usually what the refs call in that situation because they are conditioned to do that). Yao did all of this in front of a boisterous crowd of Asian-American fans who showed up at Madison Square Garden to ooh and aah all of his amazing plays. I swear they were louder than most plays when the Knicks scored. I wish I had the time to digitize the 2 or 3 dunks from this game and put them online, but I can guarantee you they will be on NBA.com, SportsCenter, or YouTube. There were that many, and they were that good, including one where he spun off his man (a la Shaq) for an alley-oop like catch where he threw it down from underneath the basket in sweeping fashion with one hand! What else can you say about Yao’s game? He was not only a force on the offensive end, but he gave the Knicks lots of fits on the defensive end, too. By halftime, he had scored 22 points on an incredible 10-of-13 shooting. Eddy Curry,, Malik Rose, and Zach Randolph were no match for him. When the game started, it looked like the Rockets were going to cruise to their fourth victory in a row. New York fell behind 10-0 and 23-11, and incredibly had missed their first 12 shots. Meanwhile, Yao was giving what many in the New York crowd had come to see. But the Rockets failed to put the struggling Knicks away early, and they even came back to take a 48-43 lead late in the second quarter. That’s when I started thinking this was going to be one of those games where the Rockets would disappoint many of their fans who had thought they had long ago progressed above the sorry scenario of losing to a poor team like the Knicks. The Rockets trailed by 3 going into halftime, and the point differential didn’t change too much in the third quarter as the Rockets only led 75-74 heading into the fourth. I was still thinking it could be one of those games where they don’t show the maturity to take care of business, and fly home disappointed. Fortunately, the “boys showed some poise.” They played their game methodically without panicking, and Luis Scola showed just how much of a weapon he is offensively, scoring on a variety of shots both inside and out, and lead Houston with 9 points in the quarter on 4-of-8 shooting from the field. 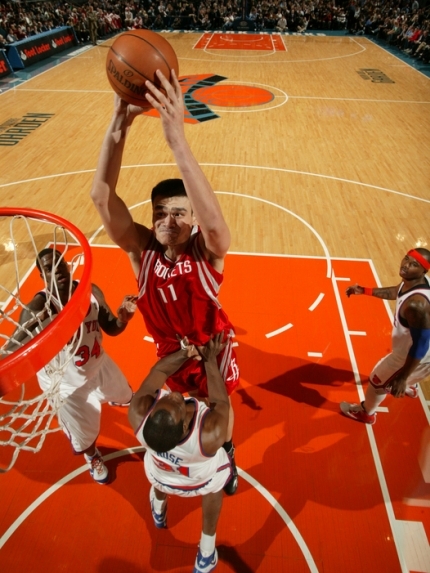 Yao did most of his damage from the line in the fourth, hitting 3-of-3 from the stripe and scoring 5 in the quarter. Meanwhile, New York withered away, falling behind by 11 points by the 6:44 mark, 87-76. But they were able to get as close as 87-80 with 5:48 remaining, but then Shane Battier crashed the boards after a Scola miss to tip-in a basket to make it 89-80. The Knicks would go on a 5-1 run to chop the deficit to 90-85. But then Luther Head drilled a three with 4:18 left, and that about sealed it. Yao wasn’t the only one getting some cheers from the crowd. New York native Rafer Alston also got some love from his hometown as he put together another good game, scoring 20 points on 8-of-17 shooting (3-of-7 from behind the 3-point line), 8 assists and 6 turnovers. I said it last night and I’ll say it again, the improvement of Alston’s shooting near the rim and in the lane in general lately has been like night and day compared to just a few weeks ago. I have never seen that dramatic of an improvement of a player in one season in my life. At 31 years of age, he could just be one of those late bloomers (that is, if he doesn’t fall too much in love with the 3-pointer — I think 7 three-point attempts is still too many). After scoring 24 points against the Wizards on Tuesday night, Luther Head played well by scoring 12 points on 4-of-11 shooting and dishing 4 dimes. But the guy whose boxscore never looks all that impressive, but really did the “little things” like what is so frequently touted by the media, was Battier. His scoring wasn’t much to write home about, scoring only 6 points (one bucket being that big tip-in in the fourth), but he had 2 steals, 5 assists and 5 blocks! Forget the scoring — I’ll take 6, 2, 5, and 5 from Shane any day. Now the Rockets get a couple days rest before facing Friday night an even worse team, Minnesota (5-29), which should push their win streak to 5 games in a row and get them to 20-17. I haven’t paid any attention to it this season because it has been so depressing for Rocket fans, but I just checked the standings for the first time in a long time, and the Rockets are only 1 game behind Golden State for the 8th and final playoff seed in the West. It’s starting to get fun again to watch the standings! This entry was posted on Wednesday, January 9th, 2008 at 11:59 pm	and is filed under vs. New York, Yao's best games. You can follow any responses to this entry through the RSS 2.0 feed. Rafer Alston deserves huge praise for his outstanding play this past week or so. Although Yao Ming has been playing reasonably well, I think Alston has been the biggest contributer to their excellent record without Tmac. Here’s hoping that when Tmac gets back, Alston has the ability to keep finishing at the rim with fewer touches, which was probably his biggest weakness last year. Its nice to see the Rockets are playing well and beating the weaker opponents during this winning streak. Its also nice to see some of the Rockets (other than Yao) step up their offense…like Rafer, Brooks, Scola and Head. The real test will be coming up in the next few weeks as they will be playing some of the more elite teams in the West. Lets wait and see first if they can at least be competitive against those teams before getting too overly excited about their recent turnaround. Just curious, was it exclusively the Asians who cheered for Yao? How did the non-Asians react to so much love for an Asian player on the opposite team? The Rockets make it 4 in a row! I was at MSG last night for the game. I wasn’t as close as ‘John Teng’ but up where the air is thin it was still great to see the game. I would say that at least a third of the fans were yao fans and I definately know the group of fellas in back of us were definately Yao fans as they were screaming at their top of their lungs with Yao’s every move! Speaking of moves, I can tell he developed a couple of them this year that I haven’t seen before (at least not on Tv). When he is positioning for post ups he is beginning to spin away from defenders ala Dwight Howard, either towards the rim waiting for alley oops or spinning to the other side of the block waiting for an entry pass from the other side. In the past he would just be spending that waisted energy and probably end up getting an offensive foul or getting the pass stolen. The only knock I have on him is that he needs to secure his rebounds more. There were probably 5 times where he lost his rebounds. Once he gets the ball he can’t just leave out like that. We need to rough up his hands with sandpaper! John the last thing is maybe I haven’t seen much of the Rockets games in full and only in highlights but how did you think the offense flowed last night? I still think they were trying to go through Yao too much and there were moments where they weren’t moving as fluid because of that. Am I wrong? Yao Ming leads the Rockets to a 4 game win streak with Tmac out averaging about 28 points 10 boards, 3.5 assists, and 2.5 blocks a game…. shooting 55+ percent… and you wanna say he’s only playing reasonably well and give the credit to Alston? GREAT WIN!! !…BUT I WOULD HAVE LOVE TO SEE AB PLAY MORE LAST NIGHT!!! YAO + SCOLA + AB=ROCKETS CHAMPIONS!!! who care about TMac back? He better go to Hollywood. Fake superstar, if he back (healty), put him on the bench, dont let him shoot the ball more then 10. Great work as you’ve always done. I love Yao’s game. He is developing the fire to dominate games. The last few games have been against below .500 teams. The next couple will determine if they are truly better. When i was watching the highlights on youtube that was upload by clutchfans, some one say Yao is a (plodder). what do you think about that?